NOTE: Turn the front wheels all the way to the left or right for mud guard installation. However, it may be necessary to remove the wheels depending on the tools being used for installation. Determine which mudguard you have by locating the part number molded in the mounting flange (5849 LH 5849 RH). 2. Remove existing fasteners from location A and B. 3. Peel red protective cover from the 3M adhesive on the mudguard. 4. 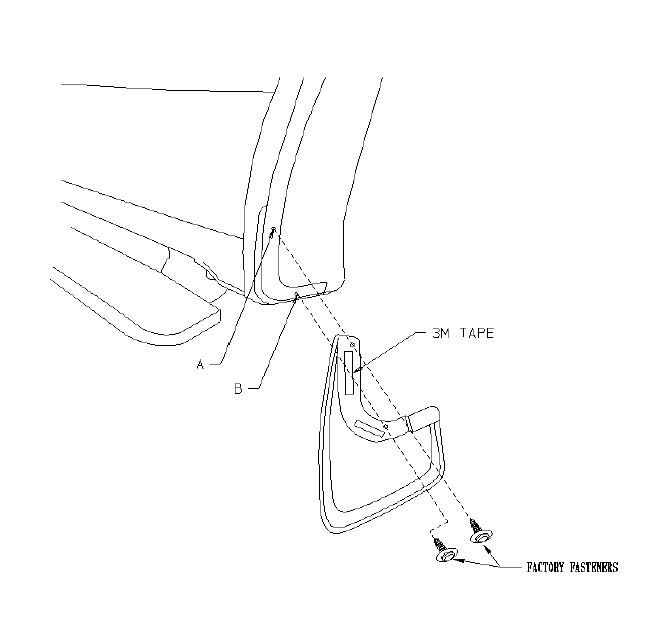 Attach mud guard to front fender with factory fasteners at location A and B, check fit and make sure mud guard is parallel to ground before tightening. Be sure to press firmly on the area with the 3M adhesive tape to make sure adhesive is set.